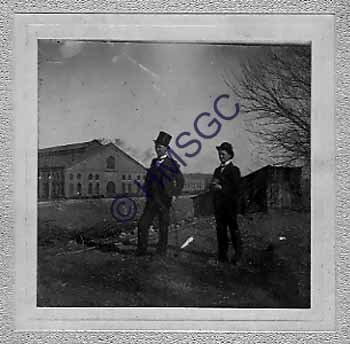 Description/History:A photo of 2 men with buildings in the background, said to be Springfield Wagon Factory. One man is wearing a top hat and carrying a cane. The other is wearing a derby hat. The picture is one of 8 donated by the Dingledein family.